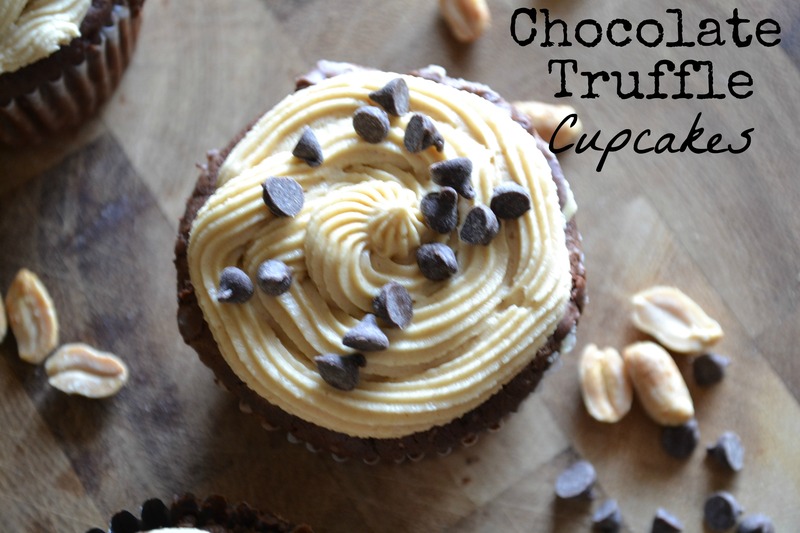 Chocolate Truffle Cupcakes: a delicious guest post! Hi my friends! I really don’t mean to rub it in, but I am currently on a white sandy beach enjoying the warm sun SOOOO…..I have a guest post for you to enjoy and it’s sure to leave you wanting a cupcake. Thanks to Becky for a delicious guest post! NUM! As you can imagine, I have been busy finding ways to use an entire case of peanut butter the past few months and I’m excited to share one of my favorite peanut butter recipes with you today! 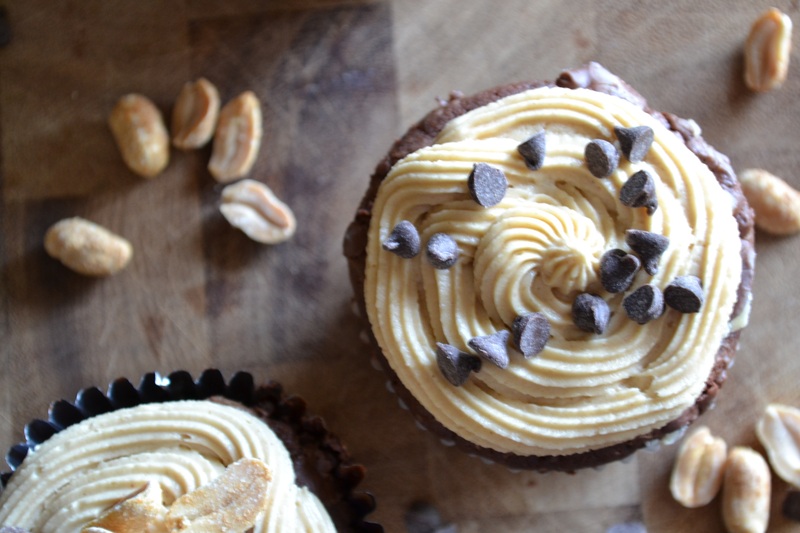 Today, my friends, I present you with: Chocolate Truffle Cupcakes with Peanut Butter Frosting! This recipe is, to say the least, delectably perfect. 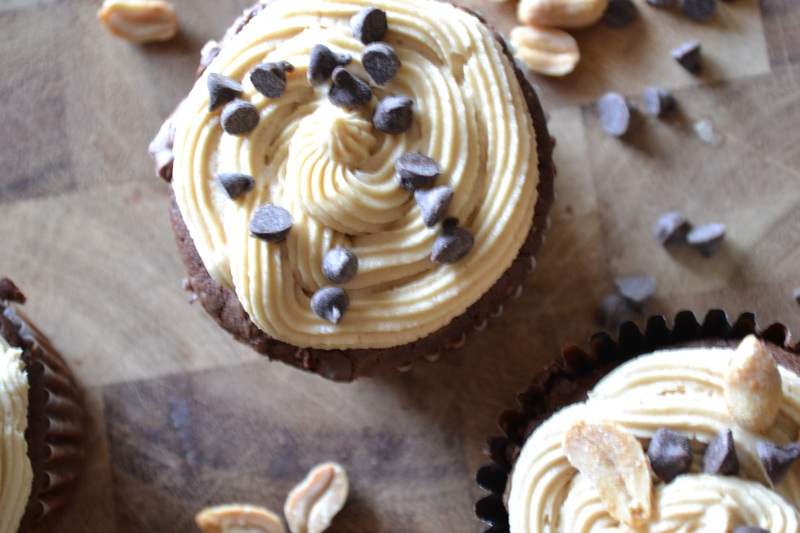 Creamy, rich and chocolate-y cupcakes topped with a salty yet sweet peanut butter frosting. The combination is as delightful as it sounds. Chocolate cupcake dough stuffed with a chocolate truffle and baked until perfectly gooey. Then coated with a luscious peanut butter frosting and a dusting of peanuts and chocolate chips. Preheat oven to 350 degrees and line muffin tin with liners. Combine cocoa, 3/4 cup flour, baking powder and salt in a medium bowl and set aside. With an electric mixer, cream butter and sugar until light and fluffy. Add eggs, individually, beating well after each addition, then mix in vanilla. On low speed, mix in flour mixture in two batches, alternating with sour cream. Pour batter into cups, filling approximately 3/4 full. Next, roll truffles in 1/4 cup extra flour (this keeps the truffles from sinking to the bottom of the cupcake) and push one flour-coated truffled halfway into each cupcake. Bake approximately 20 minutes. Remove cupcakes to a wire rack to cool completely. 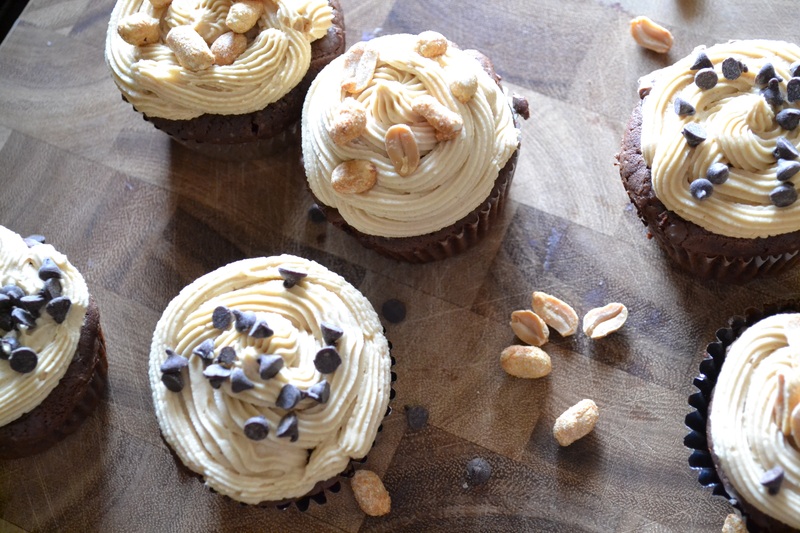 While cupcakes are baking/cooling, prepare the peanut butter frosting. Beat together butter and peanut butter until smooth, slowly add in powdered sugar and milk until creamy. 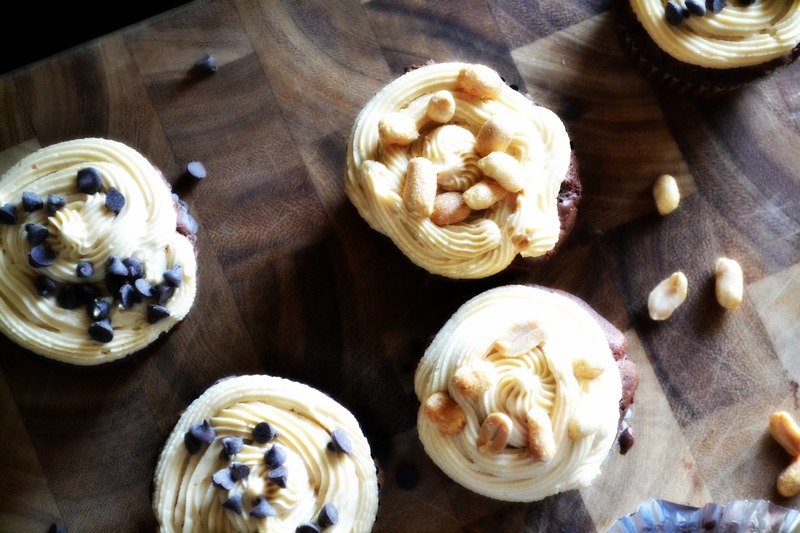 Once cupcakes are fully cooled, spread frosting onto cupcakes and top with chocolate chips and/or peanuts. Enjoy! A HUGE thanks to Melanie for allowing me to post on her blog today. 🙂 I hope you’ll stop by Olives ‘n’ Wine and see what I’m all about! 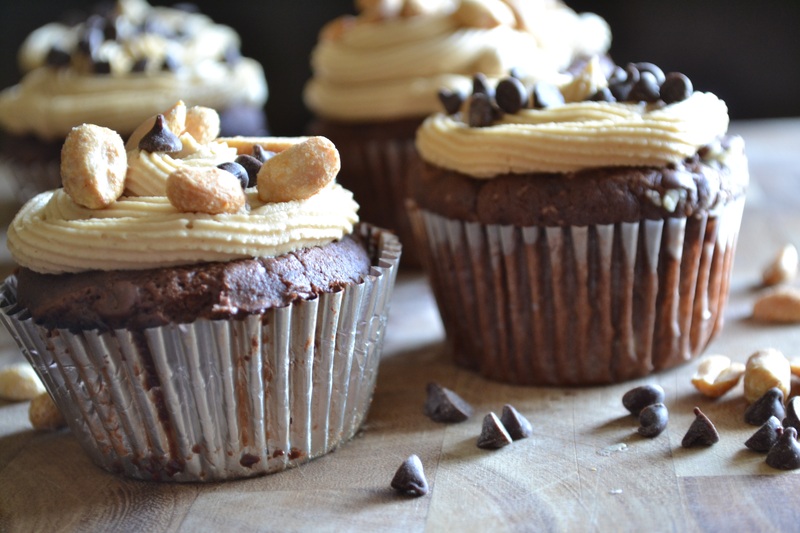 This entry was posted in Guest Post, Sweet Treats and tagged cupcakes, guest post, Parkers Farm Peanut Butter, peanut butter by Melanie. Bookmark the permalink. i just had pb frosting for the first time this week! i think the recipe was similar (if not the same as yours) and it was sooo good i ate 3 pieces of that cake!!! these cupcakes look so yummy. I love both of your blogs! 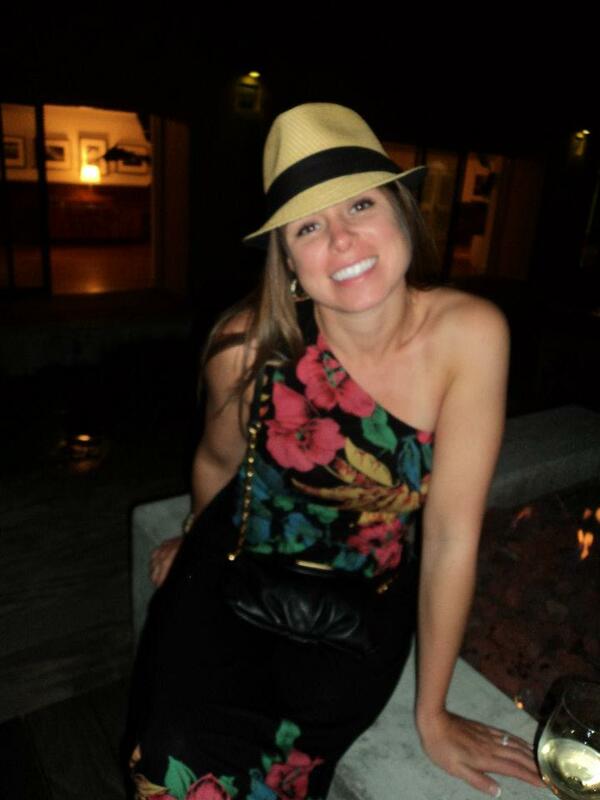 These cupcakes sound amazing and of course I hope Melanie is having an amazing time on vacation! Yum! These look delicious. Making me hungry for PB this AM! Pinned – can’t wait to try these!